The article was by Michael DeMeng ( click here– I just learned how to make these linky thingies! 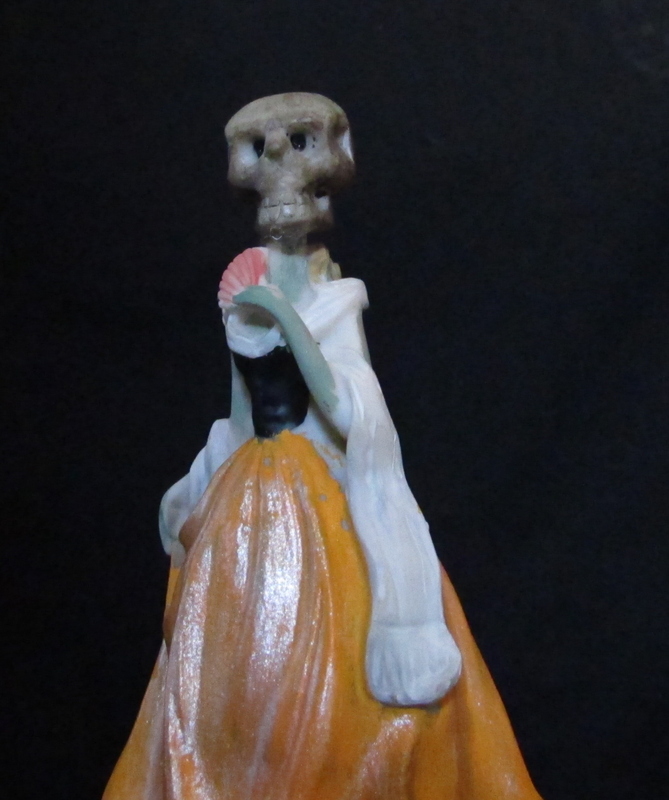 )- an assemblage artist with a spooky sensibility. The directions were to take dollar store cake toppers and chop their heads off, replace their heads with skulls, also from the dollar store, and apply sparkle paint liberally. Maybe the original directions didn’t say sparkle paint, but we wound up using some. And by some, I mean a lot. I was reminded that I wanted to blog about them when I found them in the decoration box- the photos have been sitting on my hard drive for a year. The cake toppers that the dollar store happened to have were African- American. I have to say, it felt awkward chopping their heads off- liberal guilt, I know. The original directions call for using wire to attach the skulls, so they are adjustable. We decided not to- we just hot-glued them instead. Also, the article called for a Dremel tool to cut the heads off with. I thought this might be my excuse to finally buy one, but tried a handsaw first. Let the record show that a handsaw works fine. I’ll have to find another excuse to buy a Dremel. 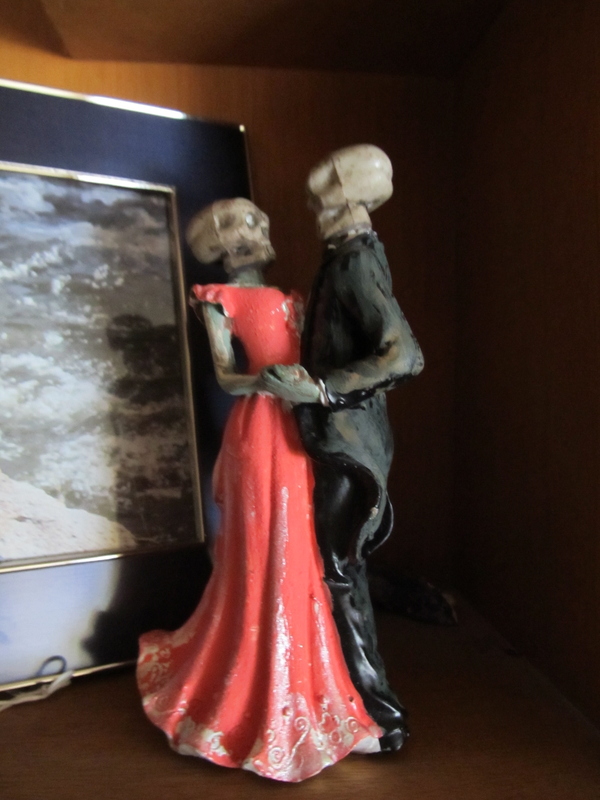 The Girl and I mixed several shades of acrylic paint together to get a nice grave shade for skin, and we went beyond just cake toppers, we loaded up on figurines, too. The one that freaked me out the most was the toddler on a rocking horse…one of the rocking-horsemen of the apocalypse? Creepy. But fun. Previous Heart on my sleeve? 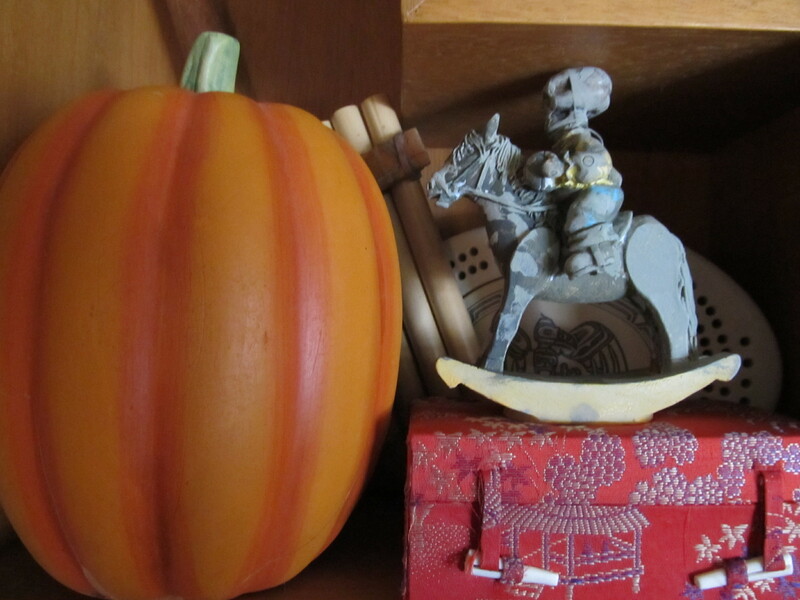 Next Pumpkins!!!! Adorable Little Pumpkins!!!!! !